How do we foster the qualities that support young people in meeting life’s changing demands? What skills and knowledge will they need to succeed educationally? These are questions that will be asked during the Economic & Social Research Council’s (ESRC) prestigious events taking place in Reading on 8, 9 and 11 November (see below for sign up). Themes that will be examined in detail include the value of alternative places and spaces for learning with a particular focus on children and young people who, for differing reasons, can face a future of disadvantage and marginalisation. Two studies concern the role of the outdoor environment drawing on research by the IoE’s Dr Carol Fuller on the impact of outdoor activities on attainment, confidence and sense of efficacy, and the IoE’s Dr Helen Bilton’s work on the importance of risk taking in encouraging young children to become independent, confident in themselves and in learning. In contrast, a third study (Porter 2016) reveals the scope for unintentional learning in the development of an ipad game with children with Down syndrome and their peers. 11th November @ 3.30 Reading Youth and Community Centre, Northumberland Avenue, Whitley Reading. Can outdoor experiences affect students’ examination grades and confidence? This week’s research article comes to us from the IoE’s Dr Carol Fuller via The Outdoor Learning Blog… by Natural Connections. Carol is a sociologist and associate professor at the Institute of Education. 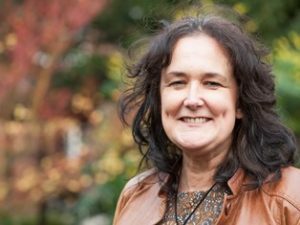 She works closely with Fiona Craig and colleagues at Ufton Court Adventure, researching the ways outdoor residential visits affect confidence, self-esteem and educational outcomes. I am involved in research that looks at ways a student identifies themselves as a learner. Both confidence to achieve educationally and their future career ambitions are keys to explaining their educational aspirations and outcomes. My research explores how attitudes towards education and future aspirations are not always directly related to actual attainment or potential. They are rather the result of a student’s own understanding of their chances of success. Sociologists (Beck, 1992; Bourdieu, 1984 and Goldthorpe 1997) have long argued that the process for developing confidence and belief in one’s ability to succeed at school, alongside the ideas young people draw on to make these assessments, are complex and myriad. Cognitive social theories of psychologists such as Bandura (e.g. 1995), for whom self-efficacy, i.e. the belief in one’s ability to succeed in specific endeavours, is in part influenced by ‘seeing people similar to themselves succeed’ alongside ‘mastery experiences’ (emphasis in the original), i.e. those that provide ‘experience in overcoming obstacles through perseverant effort’ (Bandura 1995:7) also utilises these ideas. For some students who are underachieving, the classroom can become a space that reinforces negative messages connected to how they see themselves educationally. Thus moving outside the traditional learning environment may be of particular relevance when considering the educational attainment of students from poorer socio-economic backgrounds and useful for practitioners who seek ways to promote attainment via Pupil Premium funding. The ‘Outdoors Indoors’ research project therefore aimed to look at the impact of residential experiences on the confidence and examination success of a group of underachieving young people from socially disadvantaged backgrounds. I wanted to understand and develop an evidence base to show how, and in what ways, outdoor residential experiences can influence and shape educational outcomes as well as a young person’s sense of educational confidence and ambition. The research involved a three year project which focused on two groups of year nine (age 14) to year eleven (age 16) students attending an academy school in the South East of England. 12 students had a three day residential visit twice a year for three years (six visits in total). Data was collected via questionnaire, interview and observations and also included school tracking data and GCSE attainment. Data for the students was compared a control group who did not participate in the research. The school itself is situated in an area of high social deprivation and was the most deprived area locally. 54% of its student population is considered disadvantaged and the school is positioned within the top 5% of areas most deprived nationally for education, skills and training. The research began in the summer 2013, after the school was placed on Special Measures. The school was removed from this category in Spring 2014 and then replaced onto Special Measures in January 2016. In the year that the students in this research took their GCSE exams, only 26% of the 171 year 11 cohort achieved 5 A*-C (a recognised measure of attainment in England and Wales at the time of this research), compared to 57% locally and 54% nationally (DfEa 2015). When looking at the three core subjects, the research group made significant gains in English and marginal gains in Maths – both of these were also found to be statistically significant. This is an exciting finding and one that suggests an area of great potential for further gains when embedding this aspect of the outdoor learning experiences much more explicitly into the programme. In science, the research group made a greater overall average gain than the control group. However, this was not statistically significant so is interpreted cautiously. That said, given that gains in overall scores were still observed, embedding this very explicitly into the outdoor programme is also likely to be highly beneficial. Improved relationships with teachers, family and friends were an additional positive outcome of the Ufton experiences. Improvements in confidence resulted in better behaviour at school and home and this had positive consequences for relationships outside of school. Improved confidence in school resulted in greater participation in the life of the school, and in extra-curricular activities. How can science and religion relate? LASAR (Learning about Science and Religion), set up in 2009, seeks to explore new ways to discover and advance students’ and the wider public’s reasoning about science and religion. The University of Reading is closely involved in its projects, with a significant number of staff working on the LASAR team. 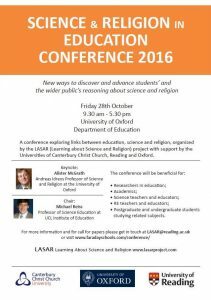 Now LASAR is hosting a highly relevant conference for all interested in science, religion, education – or all three. Some people believe that science and religion are necessarily opposed and compete for the same territory. The pervasiveness of this conflict – in schools and among the wider public – is underpinned by various factors. This conference will discuss why the conflict is so prominent and will showcase research and activities designed to support students’ and the wider public’s understanding of the ways that science and religion relate. In particular, they were concerned that school pupils may come to accept this as a normative standard: something that is both incorrect, and which could deter students who hold a religious faith from considering science as a suitable basis of future study and career. Such an effect would not only be unfortunate when there is widespread concern about the limited numbers of young people seriously considering science careers, but in principle could set up a self-fulfilling prophecy. If people of faith are significantly deterred from science, then science could over time become dominated by atheists. We need to find out more about alternative approaches to language learning to help learners become more intrinsically motivated to carry on with language study. The Institute of Education, University of Reading, has several research projects, ranging from primary languages to language teacher development. To complement this work researchers at the Institute of Education are part of a new project looking at “Linguistic creativity in language learning” – exploring alternatives to the prevalent emphasis on language learning purely for functional purposes. 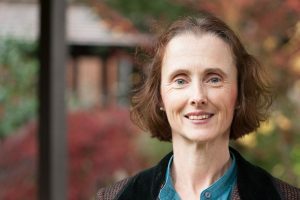 The project is part of a very significant research initiative, ‘Creative Multilingualism’, led by Katrin Kohl at the University of Oxford and involving a number of other universities. The project will explore the cognitive and cultural value of languages, and is funded by the Arts and Humanities Research Council. Professor Graham is School Director of Research for the Institute of Education (IoE), a Professor of Language & Education and Subject Leader for PGCE Secondary Modern Foreign Languages at the IoE. Did you know you can achieve your MA Education whilst working full time? Our highly regarded Masters in Education is available part-time to meet the needs of busy professionals like you. Taught modules can be taken singly or as part of an award bearing course and you may be able to transfer PGCE credits. Join us this Autumn or Spring at the Institute of Education for one of our special evenings to learn more. Helen explains: “These meetings are very informative and informal. So you will come away with all your questions answered, inspired to start your studies! “Information will be given about the content of the modules available, new modules in the pipeline, how the dissertation works, timelines and fees.